Conjugation is a mechanism of horizontal gene transfer that relies on a type IV secretion system (T4SS), a coupling protein (T4CP) and a relaxase (MOB). Conjugation systems can be found on conjugative plasmids or on chromosomes where they define Integrative and Conjugative Elements (ICE). A mobile genetic element can also be transferred by conjugation even if it does not encode for its own T4SS but uses another one found in trans, elsewhere in the genome. These mobilizable elements must encode a relaxase. Finally, T4SS can also be devoted to protein secretion (without associated DNA). These typically lack a relaxase. This website allows to query a dataset of 947 conjugative systems, 646 non-conjugative T4SS and 1,180 mobilization systems retrieved from 2,269 complete genome sequences. These systems were detected with protein profiles of T4SS components, coupling proteins and relaxases. The hits were then filtered with a criterion of co-localization. The manuscript describing in detail the method is pending acceptance, but this is a very significant update of the ones described in Guglielmini et al. 2011, and Guglielmini, de la Cruz and Rocha 2013. Proteic profiles and models used for this study are freely available in our web site for systematic searches, in the dedicated Galaxy web server (search for conjscan), or in standalone version in conjunction with MacSyFinder and MacSyView. Guglielmini J, Quintais L, Garcillán-Barcia MP, de la Cruz F, Rocha EPC, (2011) The repertoire of ICE in Prokaryotes underscores the unity, diversity and ubiquity of conjugation. PLoS Genet 7(8): e1002222. 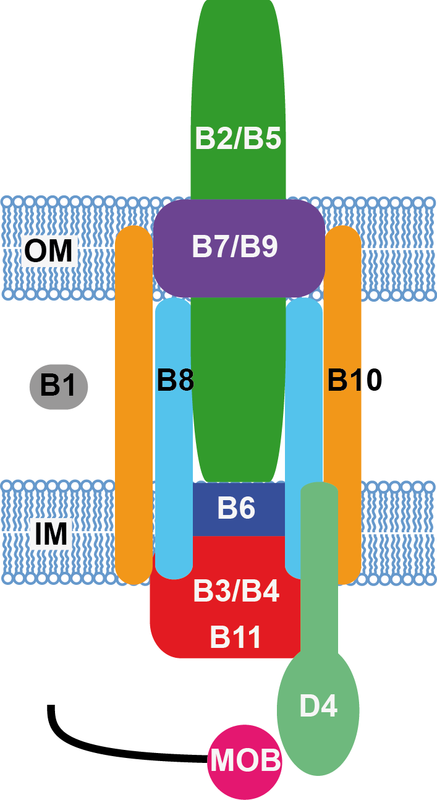 Guglielmini J, de la Cruz F, Rocha EPC, (2013) Evolution of conjugation and type IV secretion systems. Mol Biol Evol 30(2): 315-31.